A diamond’s polish and symmetry are key elements of a diamond’s cut and have a huge impact on a diamond's brilliance and sparkle. 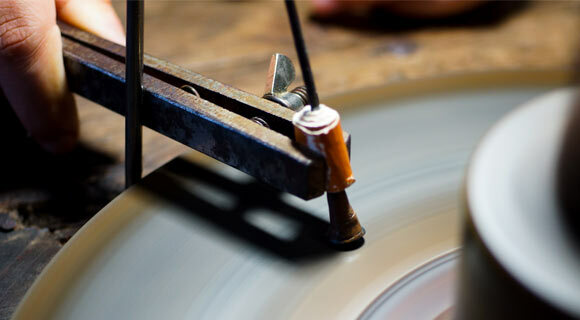 After a diamond is cut, the cutter will finish the stone to achieve a smooth, glass-like surface. The quality of this work is known as diamond polish. Gemologists, once again, examine the stone under 10x magnification in order to rank a diamond’s polish, looking for remnants of imperfections the cutter may have left behind. While inclusions occur naturally as the diamond forms, polish marks are the result of human error. Nearly every diamond has some sort of flaw due to polish. But unlike symmetry, many of these flaws are so minute that they cannot be seen with the naked eye. Scratch: A transparent-looking white line on the diamond’s surface. Nick: A small notch on a facet or girdle junction. Abrasion: A collection of nicks at facet junctions. Pit: A small opening in the surface, usually due to inclusions falling out during polishing. Lizard skin: A bumpy looking texture. Rough girdle: A girdle that has been left unpolished. Burn marks: A whitish haze on a diamond’s surface, caused by high temperatures from a polishing wheel. 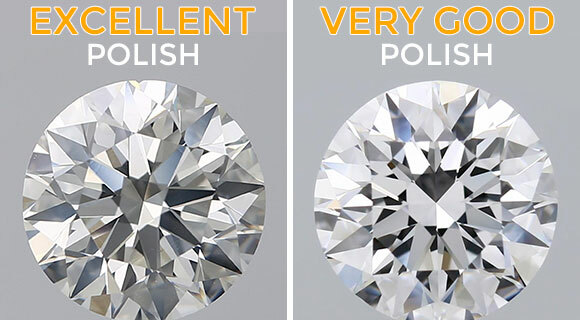 As most jewelers aim to offer their customers “Excellent” and “Very Good” diamonds, it’s unlikely that you’ll find a stone with visible polish marks. Even if you do, the polish is only one factor affecting a diamond’s fire or brilliance, making it unlikely to impact a diamond negatively on its own. Some people may choose to re-cut or re-polish their gem. This is often done on vintage diamonds with older cuts, such as the Euro diamond cut, or gems that have sustained heavy damage. The process of re-polishing a stone will also make it smaller, but the improvement in brilliance can balance the loss in carat weight and even improve the value of the diamond. To avoid having to re-polish your diamond, you should protect your diamond as best as possible. Keep your diamond jewelry clean and protect any sharp corners, such as those on princess, marquise, pear, and heart cuts. If you have an active lifestyle, make sure your diamond is in a setting that will insulate it from potential damage. Should all diamonds be symmetrical? Not always. Although diamond cutters try to produce symmetrical stones. There are other factors to consider when cutting a diamond, such as retaining weight or avoiding inclusions. To present a more appealing stone, a diamond cutter may sacrifice symmetry. 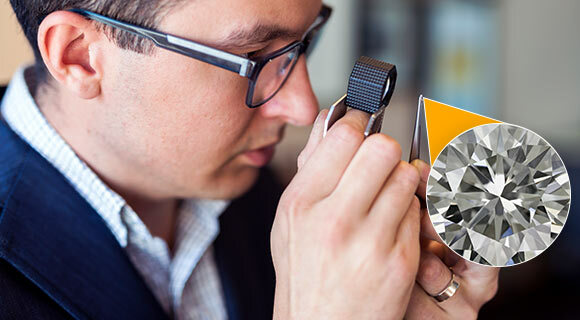 When grading a diamond’s symmetry, gemologists examine it under 10x magnification. They rank stones as “Excellent,” “Very Good,” “Good,” “Fair,” or “Poor.” Jewelers prefer to sell “Excellent” and “Very Good” stones, but you can occasionally find lower grade stones. The 10x magnification is great for seeing flaws in a diamond that you may miss with the naked eye. While you may not see a specific misshapen facet or a misaligned girdle, you can certainly tell if a diamond’s symmetry is poor. The facets and angles in a diamond help direct light through the stone. Simply put, if your diamond is asymmetrical, it won’t have that quintessential sparkle. Asymmetrical diamonds sometimes fail to meet the basic criteria for their shape. 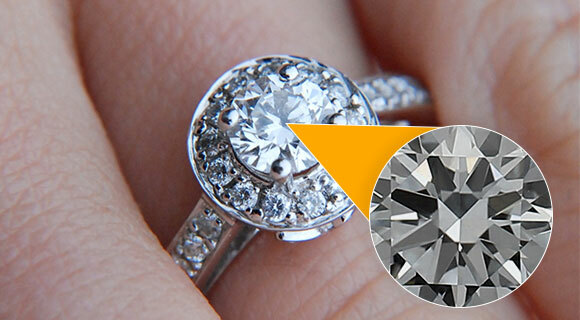 Round diamonds may look more oval. This is important when you’re buying a fancy-cut diamond (like a marquise or pear-shaped stone), as these shapes are critical to the overall look. Working with your jeweler and following rubrics for symmetry can make finding the ideal diamond easier. Is a Diamond’s Polish or Symmetry More Important? 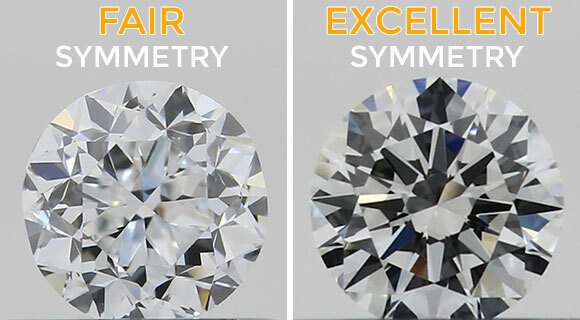 Both symmetry and polish are small parts that affect the overall cut of a diamond. But when shopping on a budget, it is important to know where you can sacrifice perfection and still get a beautiful diamond. Brilliance.com’s experts recommend a higher polish rating over a higher symmetry rating. As most fancy shape diamonds lack a prescribed structure, it can be near impossible to find excellent symmetry. On the other hand, polish is more defined and has a more direct impact on the brilliance of a stone. It may seem like there is too much to know about diamonds if you’re just starting out, but if you take the time to educate yourself, you’re sure to find a beautiful diamond and at the best price, too!